To fully understand the dollar-store appeal of Power Rangers, the first big-screen iteration of the media and action-figure line in two decades, one must sit through at least one or two of the five Michael Bay-directed Transformers movies, which is by no means an advisable experience. The two franchises are more or less the same — a busy assemblage of thinly wrought characters, unforgivably dense mythology, and barely comprehensible action sequences, all in service of gleaming battlebots for kids to smash together in the sandbox. Neither one is worthy of the remainder bins in which they'll inevitably land. And yet the difference in tone is striking. The Transformers movies may be dumb spectacles, but they're freighted with patriotic gravitas, not unlike the fighter-plane formations that streak over a professional football game. In Bay's hands, Optimus Prime is a stand-in for American military might, an outsized expression of its destructive technology and abiding values of honor, sacrifice, and teamwork. The films feel oppressive not for their stupidity but for their seriousness, and it takes the gung-ho chintziness of Power Rangers to throw those qualities into sharp relief. As Jean-Luc Godard once said, "In order to criticize a movie, you have to make another movie." Getting to the fun part is a struggle, however. First, there's the laboriousness of another superhero origin story, which director Dean Israelite (Project Almanac) and screenwriter John Gatins stage as an ersatz Breakfast Club. 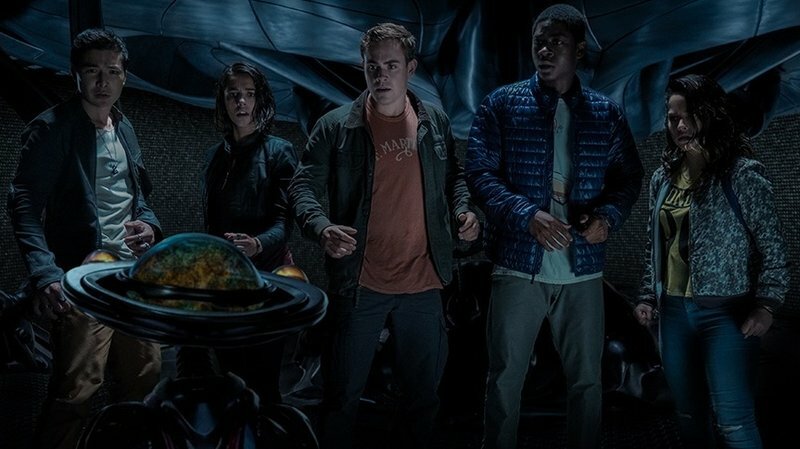 Three of the five teenagers that eventually form a mighty morphin' unit meet at Saturday detention, including disgraced quarterback Jason (Dacre Montgomery), autistic brainiac Billy (RJ Cyler), and exiled cheerleader Kimberly (Naomi Scott). (Breakfast Club fans will recognize them as Emilio Estevez, Anthony Michael Hall, and Molly Ringwald types, respectively.) They are joined eventually by two loners, Zack (Ludi Lin) and Trini (Becky G), the latter defined — far too timidly by the film — as a lesbian. The quartet comes together after an explosion at the local gold mine unearths a series of colorful gems that had been buried in the earth for 60 million years. The gems give them extraordinary superpowers, but the incident also revives an Earth-threatening battle between Zordon (Bryan Cranston) and the evil Rita Repulsa (Elizabeth Banks), who unleashes stone monsters called Putties and a golden, winged giant called Goldar. Rita comes seeking the Zeo Crystal that's buried beneath the local Krispy Kreme, and unless our young heroes can activate their full morphing power, they'll be unable to stop Rita from destroying their hometown and everybody in it. Power Rangers cost a little over $100 million to make and looks about half as expensive, unless catering services were provided by Eric Ripert. 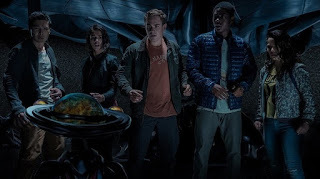 The five Power Rangers are appealing but bland, as if skimmed from a CW casting call, and Israelite stages the action sequences in a chaotic mass of swish-pans and rapid-fire edits, perhaps to hide the daytime special effects. And yet the film grows steadily more disarming as it approaches the grand finale, in part because it believes so earnestly in the unity necessary for good to defeat evil and in part because everyone appears to be having a ball. The ringers in the supporting cast make the strongest impression, from Bill Hader's voicework as go-getting alien android called Alpha 5 to Banks' full-on camp as Rita, which is like a sour twist on her glammed-up Effie Trinket from the Hunger Games series. Rita Repulsa pausing a globe-destroying melee in order to sample her first donut is a good indicator of how silly and unpretentious Power Rangers allows itself to be. By the time the "Go Go Power Rangers" theme kicks in, it takes an effort not to smile a little and more effort still to keep from laughing at yourself for giving in to it. Best just to surrender.